Let me first just say that y'all are really killing it with these post requests! Every time a new one that comes in, I'm just like, "Oh, yeah! That's an awesome idea!" So thank you for being so amazing! Secondly, let's get started on some requests, okay?! One topic I've noticed that y'all are really interested in is stress! How to manage stress, how to handle stress, how to make stress go away, how to not have a screaming fit in your car when someone cuts you off and you were already on the verge of tears because you literally could not handle one more thing. I get it. We all do a lot. People want us where they want us, when they want us there, looking how they think we should look, acting how they think we should act, and doing what they think we should do. Our smartphones make us constantly available to them. And it can get very overwhelming. I am certainly no de-stressing wizard. I freak out Jessie Spano-style from time to time just like everyone else (There's never enough ti-i-i-i-ime!). And this morning, I read on Happify that money and stress are the 2 things that people complain about the most (followed by relationships and health). 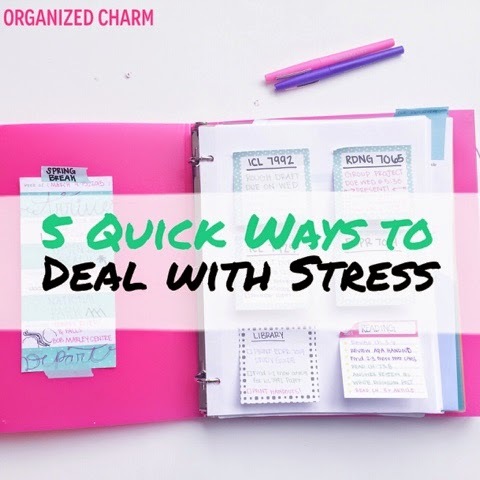 We don't want to be the kind of people who complain about being stressed out, right?! Let's jump into some quick ways to solve it! I know. I know. This is on every list and you skip past it because there is not enough time to exercise. I have literally said this a hundred trillion times. BUT last year, I was having SUCH a hard time dealing with all of the stress in my life that I just had to try something different. I started making time to do some type of physical activity everyday. Here's a whole post I wrote on how exercise helps us study better! It doesn't have to be insanely strenuous. Even just a 10-15 minute walk at the park makes a difference. Our bodies are meant to be active. They are not meant to sit stationary in a chair all day long staring at a screen. 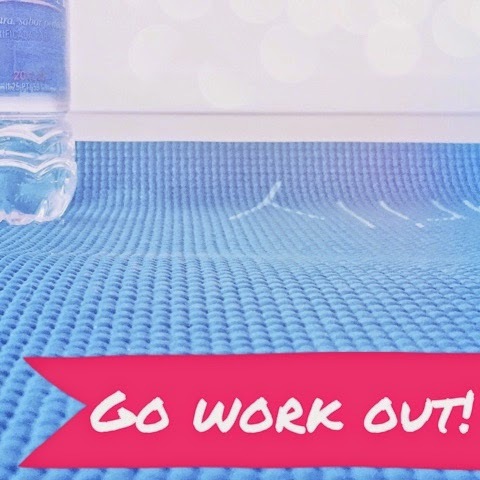 So, if you're feeling overwhelmed, get rid of some of that nervous energy through exercise! This is something that I do pretty frequently and it's also something that I boss invite coworkers/friends etc. to do when they're feeling overwhelmed as well! 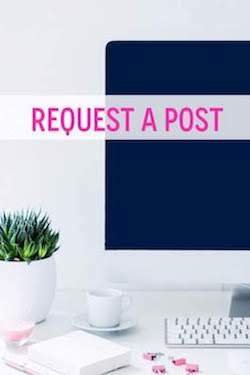 This is a really helpful idea because it immediately shifts your thought process! When things seem to be going wrong, we love to sink way down into that "bad" feeling and focus on everything that's going wrong. Acknowledge that what you're dealing with is annoying. It's totally fine to be frustrated by something that just can't seem to get done the right way! Next, name 10 things that ARE working out (a job, a compliment, a good grade, a car that works, a coat to wear, a place to live...). Then just move on! And if you're so distraught that you feel like you have nothing to be thankful for, check out these 3 links! You want to make people happy. I want to make people happy. We all want to make people happy. HOWEVER, when you spend too much time doing what others want you to do, you forget to do what YOU want to do. This is a big thing that we all have to learn because it's hard. 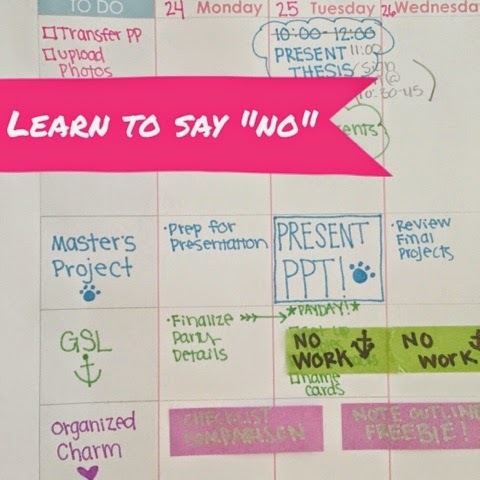 If you're already feeling overwhelmed by your schoolwork and someone asks you to cover their shift at work, you've got to say no. Don't justify it. Don't explain it. Just say it: "No, thank you.". Also, along these lines, don't be afraid to back out of something if you have too many things going on! People would rather have you 100% engaged and focused in their activity than to have your brain in a million different places. 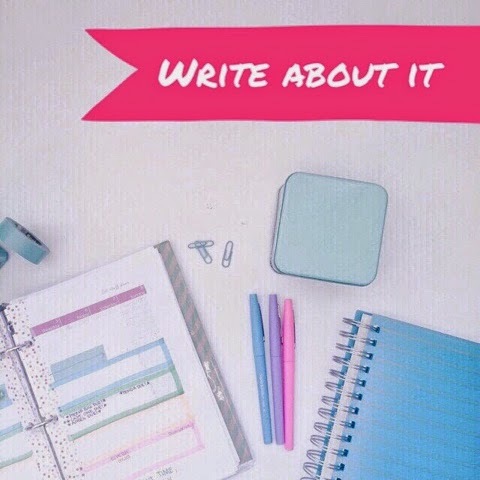 If you are trying to do your schoolwork at your internship or trying to secretly write a blog post during a sorority meeting, that may be an indication that you have too many things going on. Trim your life down to about 5 major activities and organize your time so that you can do all 5 very well! I really got into writing in 2009. I lived by myself in a studio apartment with no TV. As a way to kind of deal with boredom and manage my emotions, I started writing every night when I got home from work. I would write about things that upset me, things that made me angry/sad/happy. What's the biggest thing that I learned from that process? I learned that my problems are absolutely nothing. And I mean that. When I went back to read what I wrote, sometimes I would just laugh and thank God that nobody else could read how bratty I sounded. I have too much schoolwork due? At least I live in a country where I have the opportunity to go to school. This is super helpful for me to do. If I'm feeling like an emotional wreck on the surface, there is always, always something going on deeper... like a "heart" problem. Maybe something is going on in your family or relationship that you need to deal with. Maybe you could be more grateful or a nicer human. Maybe you've been taking in a little too much negativity from the news. Dealing with stressful life events us unavoidable. Take this science-backed quiz to find out your current stress score. This website also has tons of information on how to help you deal with that stress! Once you've identified the underlying reason or the REAL reason, you'll be able to take steps to calm yourself down and focus on the right parts of your life! What are some ways that you deal with stress? 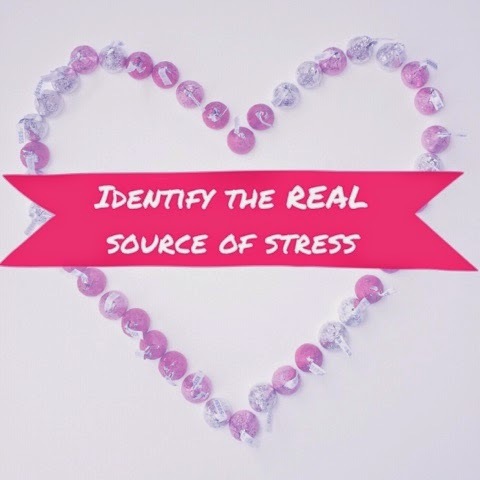 Do you think any of these links could help you manage your stress levels better? ...OR stop right now and list 10 things you're grateful for!